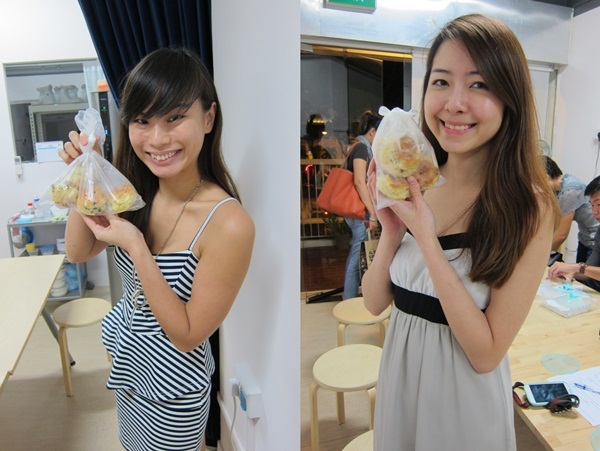 PS: The normal price for baking classes held at Baking Studio is usually in the range of $100 or more. Thus, our deal is consider pretty good. Our teacher demonstrating. She is good & patient. Cranberries can be replaced with chocolate chips, raisins, blueberry etc etc..
cos the main is the "bread" (scones), not the dry ingredients. the dough should turn out this way after rubbing. Somehow, Jess's dough seems to be a heart shape. while me, the chocolate chips scones. dough cutter to cut our dough﻿ into scones shape. but do ensure the sides of the cutter has flour on it. This is to prevent the cutter from sticking onto the dough when cutting. as the dough is kinda flat, you will not be able to fill the whole cutter with dough. from the sides & "stuff" it into the cutter (the top portion). Can refer to how Jess is doing. 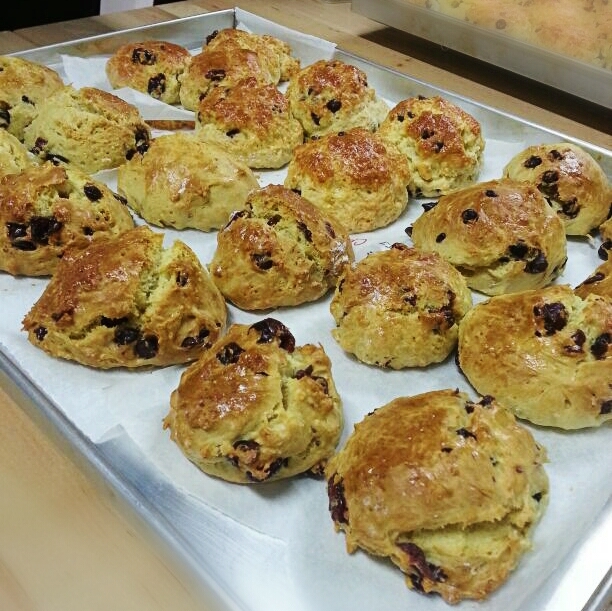 It's alright if the scones have some flour by the side. All the scones after 15-20mins!! Jess is the better baker! * NO SIEVING of plain flour is required. * Milk Powder can be replaced with Liquid skimmed/full cream/low fat milk. However if liquid milk is used, replace with water under Group C. Full cream milk powder is preferred for better taste & smell. * Both FINE or CUSTARD SUGAR can be used. * To use UNSALTED butter. * A normal egg is approximately 55g. Thus, 40g is less than 1 egg used. But not to worry, the remaining egg can be used for egg wash during baking. To use both EGG WHITE & YOLK. Step 1 to 4: Do not over-rub. 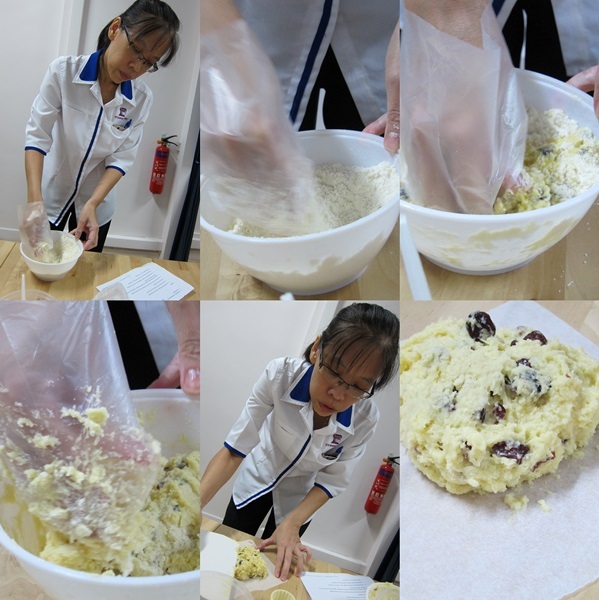 Just make sure the Group A, B & C is mixed well & not too cakey (no flour is seen at the end of rubbing. Group A should be well mixed by Group B & C). Step 5: Place the dough in the chiller for MIN 10 mins to MAX 30mins. Step 6: Make sure the dough does not shrink when cutting it. If it shrink, put it back to the chiller again. a) To obtain a "rocky" surface, dip the brush into the remaining egg (from Group C) & shake off excess before brushing onto the top of the scones. 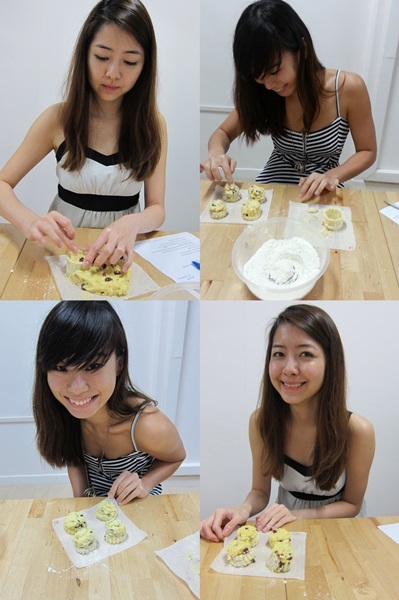 b) To obtain a "smooth" surface, dip the brush into the remaining egg (from Group C) & brush onto the scones immediately. a) 1 tray with all the scones that are to be baked (which is to be placed on the upper part of the oven). b) 1 empty tray (which is to be placed on the lower part of the oven). This is to block direct heat & prevent overheating the bottom portion of the scones.